A portion of a flat surface recessed below the surrounding area set off by moldings or some other distinctive feature. (1) Part of a wall framed by a border (molding, a decorative band) and covered with a painting or a sculptural composition. (2) A painting, usually in oil or tempera, intended to permanently or temporarily fill a section of a wall or ceiling. Mosaics, ceramics, reliefs, and woodcarvings that are used for the same purpose are also called panels. (1) A large, flat prefabricated unit used in construction. Panels are used extensively in modern prefabricated construction when erecting various kinds of buildings and structures. (2) A part of an electrical switchboard, control console, or piece of radio equipment on which control, monitoring, and signaling devices are mounted. in mining, part of the mining area bordered by the main gallery and boundary of the mining area. Extraction drifts lead into the panel and divide the panel into tiers. One of the divisions of a lattice girder. A sheet of material held in a frame. 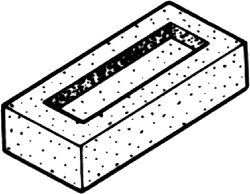 A distinct, usually rectangular, raised or sunken part of a construction surface or a material. The face of the console, which is normally equipped with lights, switches, and buttons to control the machine, correct errors, determine the status of the various CPU (central processing unit) parts, and determine and revise the contents of various locations. Also known as control panel; patch panel. A metallic or nonmetallic sheet on which operating controls and dials of an electronic unit or other equipment are mounted. A system of coal extraction in which the ground is laid off in separate districts or panels, pillars of extra-large size being left between. A large rectangular block or pillar of coal. A depression in the bed face of a brick or building block; used to provide a better key for mortar. 1. A large, relatively thin board or sheet of lumber, plywood, or other material used as a wall covering. 2. A thin board, plywood sheet, or similar material with all its edges inserted in a groove of a surrounding frame of thick material. 3. A portion of a flat surface recessed or sunk below the surrounding area, distinctly set off by molding or some other decorative device. 4. A section of floor, wall, ceiling, or roof, usually prefabricated and of large size, handled as a single unit in the operations of assembly and erection. 5. A length of formed metal sheet, or an assembly of such sheets, usually with insulation between, as used for wall enclosure on industrial-type buildings. 7. That portion of a truss between adjacent panel points lying in the same chord. i. A subdivision of a parachute gore. ii. A section of a stressed-skin structure bounded by strengthening on the ribs. iii. A mount or stack of instruments, control devices, or warning lights in an aircraft cockpit. iv. A small door in an aircraft skin used as an access panel. See access panel. (1) (control PANEL) An array of dials, buttons and gauges for configuring hardware or software. The term may refer to a panel of physical dials and buttons or its software equivalent. See control panel and HMI. (2) (flat PANEL) In the TV manufacturing industry, a panel is a TV set, as all TVs today use flat panel technologies (LCD/LED, plasma or OLED). See flat panel display. According to DisplaySearch's latest panel quotes, monitor-panel prices rose US$3 to US$7, TV panels US$5 to US$15, notebook panels US$3 to US$5, and netbook (mini-note PC) panels US$1 to US$2. The company has also announced that its customers can now recycle pre-approved ceiling panels made by USG or other manufacturers and, once customers have a full truckload, USG will pay the way. Barrow and Conrad (2006) saw this panel as proof that public interest and environmental groups are seeking to tilt the playing field against industry. On the positive side, the Panel recommended eliminating the individual alternative minimum tax (AMT), which it calls "the most vivid example of the wasteful complexity that has been built into our tax system to limit the availability of some tax benefits. This past April, on the Freidel expedition's last day of mapping and exploration at La Corona, Canuto spied a carved panel wedged into the ground inside a trench that had been dug by a looter. Remove the engine access panel inside the truck's cab. Ian Howcroft sits on the manufacturing panel as a business representative. Though Saturn long championed polymer panels while everybody else stuck with traditional stamped steel, the once-independent division is getting drawn more tightly back into the GM fold of shared products and that means a lot more steel use. Do plastic body panels have a future? Remember those Saturn commercials showing shopping carts bouncing harmlessly off of plastic body panels? Good idea, right? But apparently the approach never really caught on. Now the question is: will it ever? The 7" Modero Widescreen is the ideal solution for end users who desire the convenience of additional on-screen real estate when the surroundings call for a smaller, unobtrusive panel size. So, for example, the distribution of tape around the four edges of each panel does not follow a prescribed pattern from one to the next. Once the screening panel identifies a case with high-impact issues, the Appeals Team Manager will designate a panel of three Appeals Team Case Leaders to handle the issue or issues (two Appeals Team Case Leaders may be used, but such a change requires management approval).